From romantic gondola rides in Venice to traditional foods and so much more, Italy is a country that intrigues many people. You already know that Italian is spoken there, but did you know that it is also an official language of Switzerland, Malta, and San Marino? More than 85 million people speak Italian worldwide, and with both the increase in travel and interest in reconnecting with one's roots, Italian is growing in popularity for language learners. CyberItalian exclusively uses the Internet to provide its very detailed, comprehensive Italian lessons in a variety of ways, from basic self-study courses to hour-long private lessons. While the amount of information presented may be overwhelming to some students, CyberItalian does a good job of balancing immersive language, authentic context, and cultural enrichment to deliver a robust learning experience for students of Italian. Transparent Language offers Italian instruction for adults as an audio course and an online subscription, along with a KidSpeak desktop app solely for Windows computers. Compared with other products, Transparent Language Italian is best suited for self-directed learners, as it does not provide as much of a step-by-step progression through the language skills. LingQ (pronounced like the word "link") presents Italian lessons using authentic Italian texts and by helping students connect with native speaker "helpers", who correct non-native mistakes in students' writing samples and carry out one-on-one and group conversations online. However, LingQ's pricing plans make it difficult to know exactly how much money it will cost while working towards fluency in Italian; those connections use "points" purchased in addition to the lessons. We recommend trying the free membership first, to see if the method is a good fit. Strokes Easy Learning Italian targets beginning, intermediate, and advanced business students according to the EU Standards A1 to C1. However, we found that Strokes Easy Learning falls well below other more highly-rated products in our review, because it has few positive reviews, several errors on the website, and zero return policy. Whether you're brand-new to studying the Italian language or hoping to sharpen your Italian grammar and pronunciation, you have a variety of programs from which to choose. When deciding which program will be your wisest investment, you should take a look at each program's methods. Some Italian programs can easily meet the needs of different learning styles - visual, auditory, and so on - making use of flashcards, games, multiple choice questions, audio lessons, and pronunciation practice using a microphone to compare your accent with a native speaker's. On the other hand, a few Italian language programs emphasize one single strategy (for example, 30-minute mp3 lessons for on-the-go learning) that may or may not fit with your most comfortable learning environment. Fortunately, most providers of Italian instruction offer some sort of free trial, to help you decide if their program is a good match for your goals, learning style, and budget. Instructional Methods. Do the Italian lessons use a teaching style that fits your personality? Do they deliver instruction in a variety of ways or just focus on a single method? Skill Level. Are the Italian lessons primarily for beginners or for experienced speakers? Do the lessons let you move from one level to another for the money paid, or do you have to purchase additional products to keep progressing? Value. Is the progress you expect to make worth the amount you need to spend? 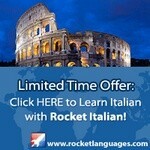 TopConsumerReviews.com has reviewed and ranked the best Italian Lessons available today. We hope these reviews help you learn one of Europe's most romantic languages quickly and easily! Hands-on lessons will be seasoned with anecdotes about the origins of some staple Italian and Italian American dishes. This class will meet for 6 Wednesdays beginning April 24th from 6:30-8:30pm.